Ten years ago, Philadelphia-based choreographer Katherine Kiefer Stark found herself sitting on an airplane sandwiched between two bulky men. Elbows tucked tightly into her sides, knees pressed together to maintain some personal space from the men on either side who comfortably occupied the shared armrests, legs wide, loudly talking to each other and occasionally questioning her as she read. 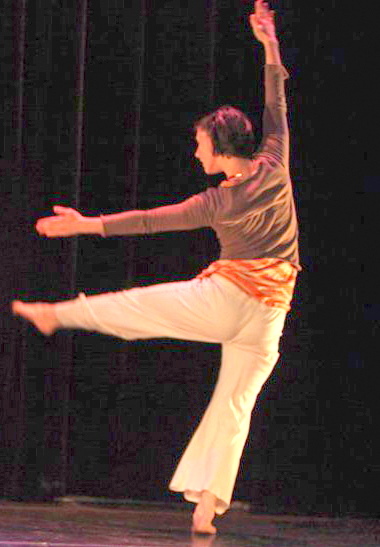 Katherine will also be teaching as part of the festival. Her class, Initiation and Follow Through blends Kline Technique, Safety Release Technique, and release technique, and is an energetic exploration of movement from the inside out. Emphasis is placed on the initiation of the movement and the path the various body parts take in space to discover how one’s own body moves within the movement. Space is embraced through phrases that move in and out of the floor and carry the movers in and out of balance. Class begins quietly and gradually builds in complexity, culminating in a dynamic phrase. Sleeves and kneepads or long pants are recommended.